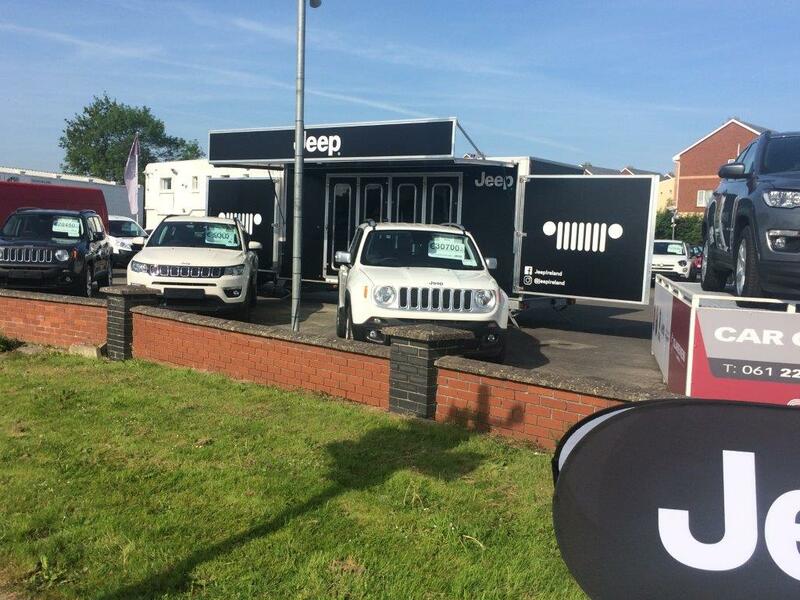 FOLLOWING with the recent launch of the new Compass, Clareview Car Sales is hosting a Jeep event in Limerick until May 30 at their premises on the Ennis Road, with the new Compass range on display along with the Renegade and Wrangler. Neil O’Sullivan, dealer principle, says that with a starting price of just €27,995 for the 120 horsepower 1.6 MultiJet Diesel engine, the all-new Compass represents outstanding value for money. In addition to the great price there is also finance available from 2.9% or up to €3,500 scrappage available, he outlined. Neil invites you to his premises to view the full range and for every Compass test drive taken he will have a special treat in store. The all-new Jeep® Compass offers an unmatched combination of attributes including contemporary but authentic Jeep design, an array of advanced user-friendly connectivity and safety technologies, excellent on-road driving dynamics, open-air freedom and legendary, best in class, 4x4 off-road capability. In Ireland, the Compass engine range includes three diesel engines and a petrol 1.4-litre MultiAir Turbo engine – delivering 140 horsepower at 5,000 rpm in combination with the six-speed manual gearbox and 4x2 configuration. The diesel range comprises the efficient 1.6-litre MultiJet engine delivering 120 horsepower at 3,750 rpm, as well as a 2.0-litre MultiJet engine delivering 140 horsepower at 3,750 rpm. Both of these engines are mated to the six-speed manual transmission, with the latter coming in 4x4 configuration. A higher output version of the 2.0-litre MultiJet engine delivering 170 horsepower in combination with the nine-speed automatic transmission and 4x4 configuration completes the engine offerings available on the all-new Compass. Three equipment levels of Jeep® Compass are offered in Ireland: Sport, Longitude and Limited. The Sport version’s standard equipment includes 16-inch alloy wheels, LED tail lights, leather steering wheel with audio controls, air conditioning, cruise control, forward collision warning plus, lane departure warning plus and a 60/40 split folding rear seat. Longitude specification adds 17-inch alloy wheels, front fog lamps, dual zone air conditioning, rear park distance control, Parkview® reversing camera, power folding exterior mirrors, keyless entry and go, Apple CarPlay and Android Auto™ functionality and a new Uconnect™ 8.4-inch infotainment / navigation system. Top of the range Limited trim equipment includes 18-inch alloy wheels, halogen projector headlamps, leather upholstery, electrically adjustable and heated front seats, heated steering wheel, a 560W BeatsAudio™ infotainment / navigation system, dark tinted privacy glass, front and rear park distance control, blind spot monitoring with rear cross path detection and parallel and perpendicular park assist. The all-new Compass has a distinctive, contemporary design with a wide stance and exceptional glass-to-wheel proportions. The SUV is immediately recognizable as a Jeep® thanks to characteristic traditional design cues, such as the seven-slot grille and the trapezoidal wheel arches. The all-new Compass is the first Jeep® SUV to offer the new Uconnect™ system, delivering communication, entertainment and navigation features that enhance both the driving experience and the passengers’ on-board comfort. The new Uconnect™ system has been improved to include easy-to-use features, enhanced processing power, faster start-up times and touchscreens that display high-resolution graphics. Driver and passenger safety were paramount in the development of the all-new Jeep® Compass, which attained a 5-star Euro NCAP score. The car offers more than 70 available active and passive safety and security features including Forward Collision Warning-Plus, LaneSense Departure Warning-Plus, Blind-spot Monitoring with Rear Cross Path detection, Parkview® rear backup camera with dynamic grid lines, Automated Parallel and Perpendicular Park Assist, Electronic Stability Control (ESC) with electronic roll mitigation and six standard air bags. So come on and visit Clareview Car Sales and see the new Compass for yourself.